It was Pinky’s third Birthday yesterday and to celebrate we had family over for a little party. I have a big family so when everyone comes over we don’t have even close to enough seating for everyone. 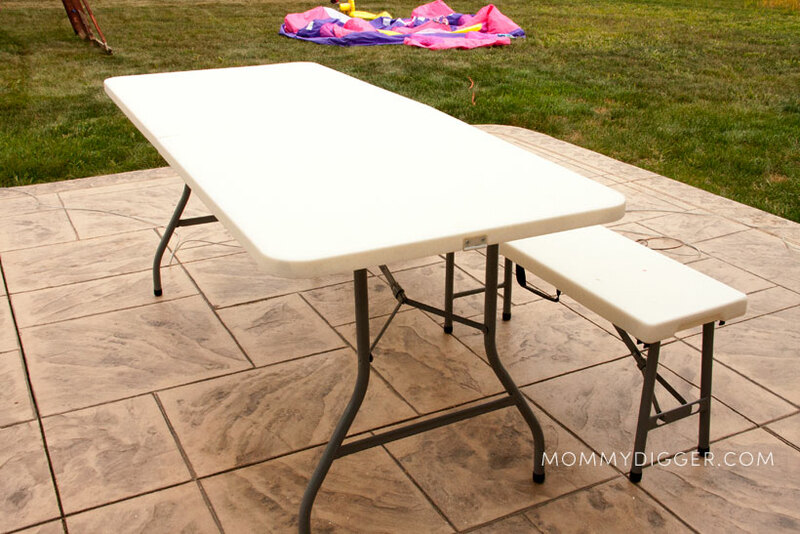 When BrylaneHome asked me to review their Resin Folding Table and Folding Bench I was excited because it meant we’d have a portable and easy to store way to provide enough seating for our guests. I’ve seen a lot of folding tables before but never a bench too! The first thing I noticed when we opened the box was how solid the seating and tabletop surface are. Setting them up was super easy, you just undo the snap on the side and open it up and pull out the legs. We can get out out and setup in under a minute! When it’s time to take them down, you just fold them up and carry them into storage. They even have a handle to help make carrying it easier. I love the table and bench and it makes setting up for a party or get together easier. It provides lots of extra seating or we can use the table for a hor dourves and buffet table. When your done with them, it’s super easy to break them down and they are light to carry. They also don’t require a whole bunch of space to store, we fit them along the wall of our garage and they take up very little space. They are so handy to have around for all sorts of occasions and very well made to last for years and years. Buy It: This Folding Resin Table and Bench are available on BrylaneHome. Be sure to check out all their wonderful products for your home! Plus, if you sign up for emails from BrylaneHome you’ll get FREE SHIPPING on orders of $50 or more in your inbox! The benches are so useful, aren’t they?! I love this table. I really want one! You can take it anywhere! It’s great! The table looks great and it really looks easy to set them up. Happy birthday to Kylie too. You caught my eye with free shipping! I’ve been meaning to buy one of these tables forever so I can stop borrowing my Mom’s. They’re so handy for everything from kids’ birthdays to buffets and even yard sales! Thanks for the info.